The veins, tested in large animals, could someday be used in humans in need of heart surgery and dialysis. Scientists have made bioengineered veins that might someday be used in vascular surgeries in humans. In a study published in Science Translational Medicine, a group of scientists from Duke, Yale, and East Carolina Universities demonstrated the effectiveness of the veins, which were generated by culturing human cells in a bioreactor to form tissue. The veins would be available for surgeries “off the shelf” and at the moment a patient needs them, and are less likely to become infected or clotted, according to a press release. The research was funded and partially conducted by Humacyte, a regenerative medicine company that works to engineer human tissues. One application for the new veins could be in coronary bypass surgery. 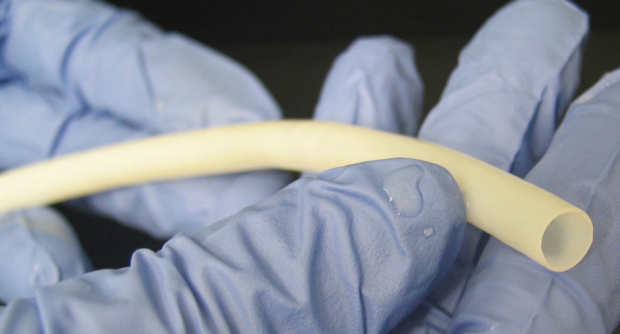 “This new type of bioengineered vein allows them to be easily stored in hospitals so they are readily available to surgeons at the time of need,” said East Carolina’s Dr. Alan P. Kypson, M.D., one of the paper’s authors. “Currently, grafting using the patient’s own veins remains the gold standard. 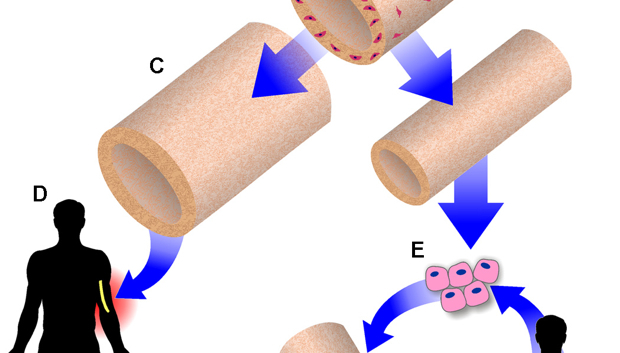 But, harvesting a vein from the patient’s leg can lead to complications, and for patients who don’t have suitable veins, the bioengineered veins could serve as an important new way to provide a coronary bypass.” The veins could also be used in patients whose kidney failure demands dialysis, but who lack veins healthy enough for the procedure. The bioengineered veins aren’t ready for prime time yet, at least not in humans. What the team has achieved thus far was to generate the veins and store them for up to 12 months before testing them in “large animal models” for up to a year. The senior author of the study was Dr. Laura Niklason of Yale, who made headlines last summer by creating a lung in a laboratory that a rat was able to breathe with, something Science hailed as heralding a future of replacement lungs for patients.